What would you learn from this book? The Hebrew Alef-Bet is more than a simple series of letters - it is a source of values and priorities. It provides its own perspective on life. Discover each letter's unique meaning and what it contributes to our understanding of how the world was created. Traditional stories teach that HE who knows how to combine the letters of the Hebrew Alef-Bet can create or destroy worlds. It is said if the letters were to remove themselves from the heavens above us, even for an instant, and return to their source, the entire heaven would become an instant vacuum. "The Wisdom of the Hebrew Alef-Bet" examines each of the letters, from Alef to Tav, and explains the wisdom and understanding embodied in each one. The book is rich in tradition and will challenge your understanding of the role Hebrew letters play in the world and how it's creation . From the very first Kabbalistic work, through the Talmud, through an impressive array of rabbinic literature, great minds have found the Aleph-Bet to be a gold mine of wisdom and guidance. This fascinating best-seller weaves these golden threads into a glorious tapestry, presenting hundreds of ideas and comments on the Aleph-Bet, including: the Aleph-Bet as the force of Creation, as a primer for Jewish living, and as a fountainhead of Torah insight and mystical meaning. The product of decades of learning, thinking, and teaching by the revered educator, lecturer, and community activist Rabbi Michael L. Munk. A treat not to be missed! Unlike so many of those pseudo-kabbalah books on the market, which attempt to use the Hebrew alphabet and its numerology for fortune-telling, this book is solidly grounded in authentic Torah sources. Like all of Artscroll's publications, the approach is Orthodox, but also accessible to both Jews and non-Jews of all backgrounds. This is not an easy-read "spirituality" book, however. It is a detailed set of Torah lessons, to be savored slowly, one letter-chapter at a time. The author also assumes that you are either familiar with basic Hebrew terms, or at least willing to take the time to learn them. 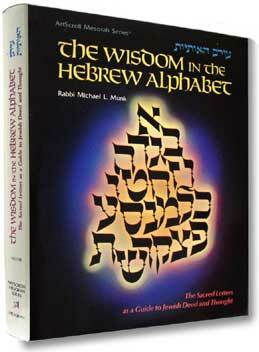 But even if you do not already know the Hebrew alphabet, this book will help you understand the deeper wisdom within traditional Judaism.